Juventus new boy, Cristiano Ronaldo scored just eight minutes into his Juventus debut and was mobbed by fans as a pitch invasion saw the game abandoned early. Thousands of fans flocked to get a glimpse of Ronaldo at the small town of Villar Perosa outside of Turin, where the Juventus owners hold a pre-season friendly between the first team and the reserves every year. 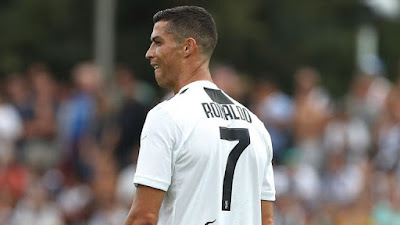 Ronaldo scored the first goal in Sunday's 5-0 victory for Juventus' senior side, just a month after the 33-year-old completed a £105m move from Real Madrid. Those attending the game at the estate in Villar Perosa, which belongs to the Agnelli family which owns Juventus, traditionally invade the pitch at the full-time whistle but after some supporters encroached prematurely in order to ensure they got close to Ronaldo, a full pitch invasion followed and the game was abandoned after 72 minutes.